The 3rd-seeded ’03-’04 Flames outshot the 7th-seeded ’84-’85 Flames 45-31 in Game 1, but it was the ’84-’85 Flames that won, 4-1. Goalie Reggie Lemelin made 44 saves to lead them to the opening win. It was the same thing in Game 2, with the ’03-’04 Flames dominating in shots on goal, but the ’84-’85 Flames won the game, 6-2. Eddy Beers, Kent Nilsson and Hakan Loob all posted three points in the win. The ’03-’04 Flames finally got on the board in the series with a 5-3 win in Game 3. They scored four goals in the second period from four different players, but Dean McAmmond‘s three points led the way. Then, on the back of three goals in the first and second period, the ’84-’85 Flames won Game 4, 6-1 with defenseman Paul Reinhart netting two goals. The ’03-’04 Flames avoided elimination with a 6-1 win in Game 5 while scoring all six goals in the first period. Two of those six came from Oleg Saprykin while Shean Donovan tallied three assists. Game 6 was tied 1-1 after the first period, but Doug Risebrough scored the lone goal in the second to give the ’84-’85 Flames a 2-1 lead heading into the third. Then, with less than eight minutes left in the third, Matthew Lombardi potted a PP goal to tie the game at two. A little over three minutes later, Richard Kromm gave the ’84-’85 Flames the lead right back, but the ’03-’04 Flames scored another PP goal to tie with less than two minutes left. So, in the final minute and the game tied 3-3, Kromm scored his second in a little over four minutes to give the ’84-’85 Flames a lead to close out the series. 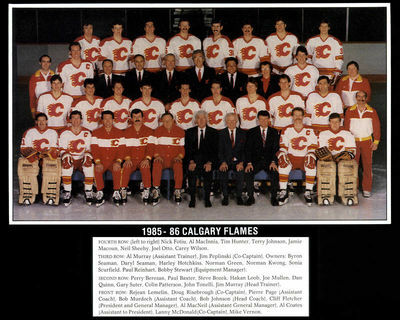 The 2015 Calgary Flames Qualifying Final will be the top-seeded ’88-’89 Flames against the 7th-seeded ’84-’85 Flames! This entry was posted in Qualifying Tournament, Ultimate NHL Playoff and tagged Calgary Flames, Chris Clark, Chris Simon, Dean McAmmond, Doug Risebrough, Eddy Beers, Hakan Loob, Jarome Iginla, Jordan Leopold, Kent Nilsson, Lanny McDonald, Matthew Lombardi, Oleg Saprykin, Paul Reinhart, Qualifying Tournament, Reggie Lemelin, Richard Kromm, Shean Donovan, Steve Bozek, Ultimate NHL Playoff. Bookmark the permalink.